As a part of the HSE-El Paso administration team, we are very excited to start the 2018-2019 school year. We hope you are enjoying your summer vacation with your family and are ready for school. Before school starts, we’d like to keep you updated about back-to-school preparations. Students and parents/guardians are cordially invited to attend our Orientation on August 10th for NEW and RETURNING students. Orientation will take place from 9:00 p.m. to 4:00 p.m. for grades K thru 6th. During this time you may bring in supplies to your child’s homeroom teacher for students in grades Kinder-3rd. For 4th – 6th grade students, a locker will be assigned, so please bring a combination or key lock. Students will be required to wear khaki, navy blue or black “Docker style” pants (no Jogger pants) or uniform style shorts (no Cargo shorts). NO SKIRTS/SKORTS FOR ANY GRADE ALLOWED. All students will be required to wear the HSE uniform shirt; plain, store bought red polo shirts will NOT be allowed. Students in grades K thru 2nd will be permitted to use backpacks (NO rolling backpacks). 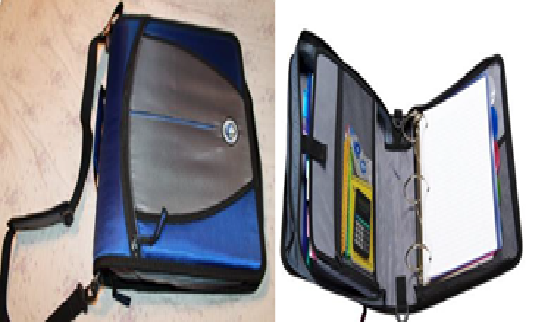 Please make sure the size of the backpack is appropriate to fit in the lockers. 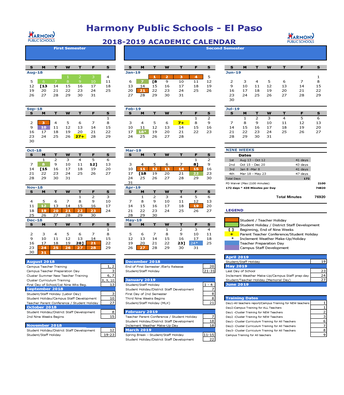 2018-2019 Harmony School Calendar is attached. We will also have extra copies at Orientation on Friday, August 10, 2018, and we will keep some copies in the Front Office. Please see below. School starts August 13, 2018. We will have no school on September 3rd due to Labor Day holiday. Breakfast is provided between 7:10 a.m. to 7:35 a.m. I would like to let everyone know that we use raptor software to help protect your children. Raptor helps track visitors, contractors, volunteers and students at our school, thus providing a safer more monitored environment for the students. When visitors, volunteers or contractors check in, they will give their license or valid ID to the person at the front desk to scan their form of identification. If you are picking up your child early from school for any reason, you are to present your driver’s license or valid ID also. In addition, if your child is being picked up from school by someone else than a parent, then they need to be on the pick-up list that was in the registration packet. If you need to update the pickup list, then go by the front office and update it. All visitors are to check in at the front office each time with a valid ID if they would like to enter the school for any reason. Visitors are not allowed through the school doors unless they have permission and checked in at the front office. We feel certain this will help us keep our campus a little safer, and ask for your cooperation in presenting your valid ID when checking in at the school. 1. Deposit money, at least $25, into your child's account at the Front Office with debit/credit card only or through School Café APP or www.schoolcafe.com. 2. As your child eats breakfast/lunch, the price of lunch/breakfast will be deducted from the account. 3. If your balance is $5 or less, you should make another deposit. Your child will still get breakfast/lunch. 4. If your balance is negative $10.00, your child will get an alternative breakfast/lunch. Before your child can get breakfast or lunch, your child will need a positive balance in his/her account. When you login into School Café App or website, you can see your child’s balance. You may also be notified if your child's balance is low but it is also your responsibility to check your child's lunch/breakfast balance. 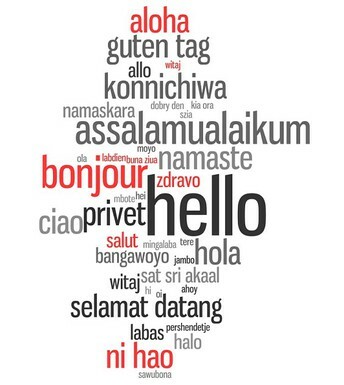 Harmony School of Excellence is proud to offer our 4th, 5th and 6th grade students the opportunity to be exposed to different languages, which include Spanish and Turkish. Language selection is on a "first come, first serve" basis. You may not get your first choice/preference. Changes in Language Selection will not be permitted after form submission. Please fill out the form below for your language selection/preference for 2018-2019. Student planners will be on sale at Orientation for $6.00 each. We have Primary planners for Kindergarten, 1st and 2nd, Elementary planners for 3rd, 4th, and 5th grade students and Middle School planners for 6thgrade students. If you do not get to purchase the planner during orientation, then please purchase it during the first week of school. 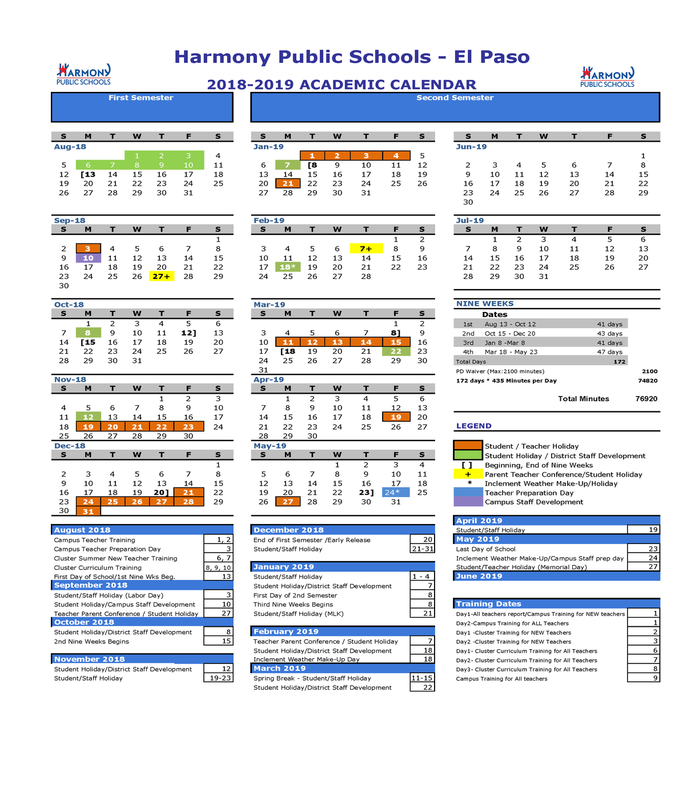 K – 6th Student Planners are mandatory. 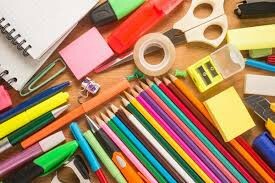 2018-2019 school supply lists are available on our website: https://hseelpaso.harmonytx.org for those opting out of the online ordering option. *Students in grades 4th-6th will be assigned a locker during Orientation on August 10, 2018 from 9 am - 3 pm and during the first week of school. Please do not send ALL school supplies until your child has been assigned their locker. THE PRINCIPAL OR DESIGNATED SCHOOL ADMINISTRATOR, WILL HAVE FINAL APPROVAL AS TO IF THE ABSENCE WILL BE EXCUSED. All notes will be kept on file and marked excused or unexcused upon date and time of receiving the note. When school officials do not know the reason for an absence, they must assume that it is unexcused. If your note/absence is unexcused, a notice will be mailed. Vacations are not an acceptable cause for an excused absence from school and will be UNEXCUSED. When a student’s absence for personal illness exceeds three consecutive days, a note from a physician or health clinic verifying the illness will be required. If the physician or health clinic note is not received for a personal illness exceeding three consecutive days, the absences will be UNEXCUSED. If your child has a doctor or dentist appointment during the school day, then you would need to sign out your child in the front office. When your child returns to school, then you are to bring a doctor’s excuse for the appointment. 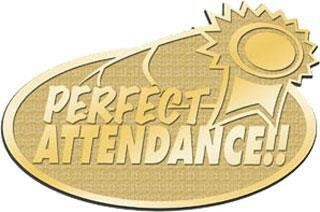  To receive credit for a class, the student must have been in attendance 90% of the days the class is offered. Excused absences do not count as a day of attendance toward earning course credit. Education Code § 25.092(a) does not distinguish between excused and unexcused absence; the student must be present for at least 90 percent of the class days in a semester to earn credit. However, an attendance hearing committee may grant the student class credit in extenuating circumstances despite a failure to meet the attendance requirement.  Parents and students are subject to prosecution under Education Code, Section 25.093 if the student is absent from school without an excuse. At the end of each semester at the award ceremony, the student with perfect attendance will be awarded a trophy, medal, pin, or gift certificate and there will be drawings for big prizes and gift cards. The child must be present for each class; therefore, a child cannot have any tardiness or early dismissals to have perfect attendance. Your school has partnered with SchoolReach Instant Parent Contact. We are proud to provide your school with the most advanced, state-of-the- art school to parent communications system available on the market today from school closings to emergency communications to meeting reminders and more. SchoolReach will make your life easier. All you have to do is provide the school with the phone numbers and e-mail addresses you want contacted and you're set! If you happen to miss a SchoolReach announcement from your phone, then please call the number on the side. We encourage you to call this number to get the message instead of calling the Front Office for the missed message. ALL students MUST wear the Harmony School Uniform shirt. This shirt must be purchased from the school. NO PLAIN POLOS ARE ALLOWED. SCHOOL UNIFORM SHIRTS ONLY! The uniform shirt has to look neat free of holes and tucked into uniform pants. Properly fitting navy blue, khaki or black "Docker style" pants. NO SKIRTS/SKORTS, NO CAPRI PANTS, NO CARGO STYLE PANTS AND NO JOGGER STYLE PANTS. Socks need to be white, navy blue, or black and must be worn at all times. Shoes need to be Dark-colored, laced-up shoes or loafers with closed toes/heels or athletic shoes. No Bright-Flourescent Colors. No sandals, flip-flops, boots or high heels. Parents will be called to bring a change of clothes/shoes or pick up a child if he or she violates the dress code. Parents please follow our drop-off and pick-up procedures for the safety of our students. You will receive this information during orientation. Students should not arrive on campus before 7:10 a.m. Students should be picked up by 3:15 p.m., if not the student will be placed in the afterschool program for a fee. If your child is a walker or rides the bus, please pick up a form in the Front Office to have a record on file. As you are dropping off or picking up your child, please be mindful of children and watch your speed. We ask that all parents remain in their cars to ensure a safe and timely dismissal. For the safety of our students, please follow dismissal procedures and staff directions. Please make sure that your child is current with their immunization shots. Please go to http://www.cdc.gov/vaccines/recs/schedules/child-schedule.htm to see the requirements. Please, do not send any medication to school with your child. Here are the guidelines for medication administration. ▪ At least one dose of any new medication must be given at home. ▪ All medication labels/containers must be in English for stay to avoid errors when administering. ▪ No Herbal or Dietary Supplement will be administered by school unless written permission from a Physician. ID cards will be issued to each student. ALL students will need to pay $5.00. STUDENT ID’S ARE MANDATORY. Student must wear their ID at all times. This card allows students to attend school- sponsored functions. Students will be asked to show their ID card in order to order breakfast or lunch. For ALL students if their ID is lost, he or she should go to the Front Office before or after school to purchase a replacement for $5.00. Students shall return their Student ID cards upon withdrawal from the school. · All snacks MUST be store-bought and individually wrapped with a label of ingredients on the wrapper. No homemade food will be delivered to students. 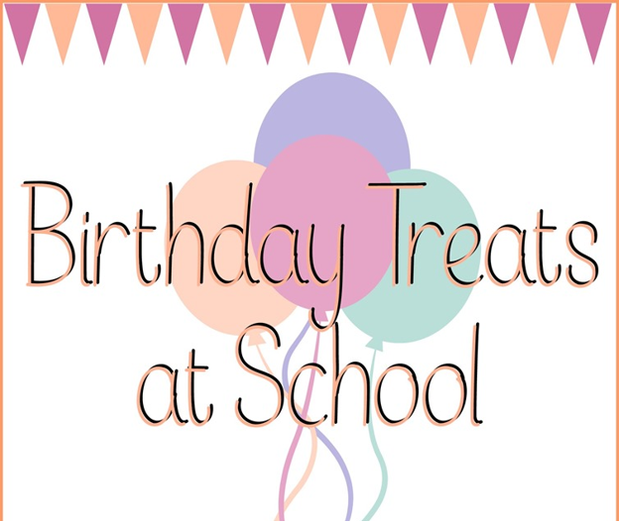 · Parents are welcome to join their child for birthday lunch in our school cafeteria. However, outside food such as pizza can ONLY be distributed to your own child. In order to meet the nutritious meal as defined by the Texas Department of Agriculture and the School Lunch Program, all snacks will be distributed during the last five minutes of the day. We ask for your full cooperation in this matter as we work to ensure the safety of all students. All school items, event tickets and/or bracelets purchased at HSE are FINAL SALE. We will not be providing any refunds and/or exchanges.